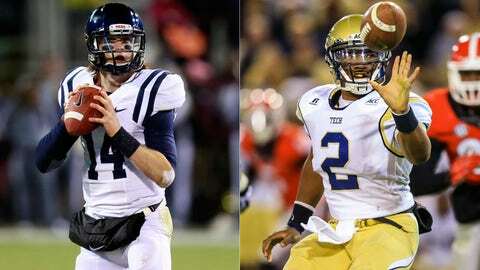 Bo Wallace (left) and Ole Miss are seeking the program's sixth straight bowl win, while Vad Lee's Yellow Jackets are after a second win in nine postseason appearances. Even though both teams have 7-5 records, this could be one of the more entertaining matchups of the pre-BCS bowl season if Hugh Freeze has his defense freewheeling and Georgia Tech finds its rhythm in the triple-option offense. The Rebels field a defensive front full of talent and potential with men like Robert Nkemdiche and Channing Ward rushing from the ends and tackles Levon Hooks and Woodrow Hamilton shooting gaps in the middle. But the Yellow Jackets counter with senior running back David Sims, a 6-foot, 225-pound speedster who rushed for 846 yards and 11 touchdowns this season, including a 100-yard performance in Tech’s double-overtime loss to Georgia. The triple-option is always tough to defend, but Ole Miss has shown spurts of defensive brilliance this year against teams like Auburn at LSU. If the Rebels defense plays with the kind of intensity they showed in their close loss at Auburn and their upset win over LSU, Hugh Freeze’s squad could shut the Yellow Jackets down. The player to watch is the quarterback … actually, both quarterbacks. If Vad Lee, who is anything but a pocket passer, can connect on a couple of long passes as he did against Georgia, the Jackets could open up a sizable lead. But if the Ole Miss quarterback Bo Wallace avoids turnovers and runs the fast-tempo offense that Freeze wants, the Rebels could control the clock and the scoreboard. In a game of evenly-matched teams, which this one most assuredly is, big plays often determine the outcome. More often than not, those plays come down to the quarterback. 12 — Georgia Tech has 12 different players who have rushed for more than 100 yards this season and the Jackets quarterback, Lee, has 489 yards and eight touchdowns on the ground to go with 1,414 yards and 10 scores through the air. On the other side, Ole Miss ranks 41st in points allowed and 50th in yards allowed per game. The Jackets are coming off a heartbreaking double-overtime loss to Georgia, a game they led until late, while the Rebels lost ugly to Mississippi State in the Egg Bowl. Given the trajectories of the two teams, the edge has to go to Georgia Tech, but it all depends on which teams show up. With receivers like Donte Moncreif and Laquon Treadwell and a quarterback like Wallace, who has a strong arm, Ole Miss at its best should beat Georgia Tech at its best. But neither team played its best late in the year. This one will likely come down to who makes big plays and who makes the fewest mistakes.